Arrive in Goa and get transferred to your hotel. Check-in to the hotel and spend the day at leisure. Popular for its seafood, nightlife, Portuguese architecture and culture, Goa is India's favourite beach destination. 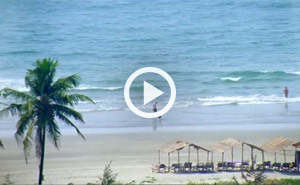 Enjoy a relaxing overnight stay at your hotel in Goa. After breakfast, spend the day at leisure in the city of beaches or set off on an optional South Goa tour. South Goa is famous for its immaculate beaches. Return to your hotel for dinner and enjoy a relaxing overnight stay. Today, post breakfast, it's time to tour North Goa. Start with Fort Aguada, the most crucial fort built by the Portuguese on the river Mandovi. Later, visit the Basilica of Bom Jesus church where the mortal remains of St. Francis Xavier have been conserved for more than 460 years. Conclude your tour by exploring the capital of Goa, Panjim. Proceed to experience a scenic cruise on river Mandovi. Enjoy dinner followed by an overnight stay in the hotel. After breakfast, check-out from your hotel. As you are dropped to your airport/railway station, say goodbye to this charming city. Click here for more Goa Holiday Packages. Prices are quoted per adult on a twin-sharing basis in a budget hotel with breakfast, above mentioned tour and airport transfers.